Hasbro has been known to create theme versions of the popular board game Monopoly. From Star Wars to Harry Potter to Indiana Jones, several media that have been adapted into their own versions of the game. That trend still continues. 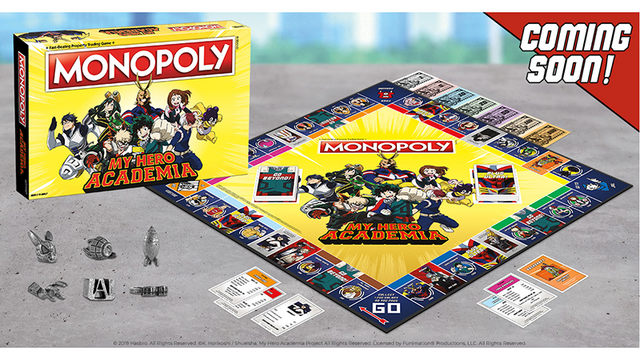 My Hero Academia joins the long list of Monopoly theme games based on popular media. Like the traditional game, it includes token pieces, paper money, Chance and Community Chest cards. However, these have been changed to suit the game’s theme. The new edition of the classic game advertises itself as a “real-life battle simulation that will hone your buying, selling, and trading Quirks.” Property squares are replaced by students from Class 1-A and notable faculty members. Rack up Rewards and Trophies for your sponsored superheroes in place of houses and hotels, and brace for the victory or defeat that comes with Go Beyond! and Plus Ultra! cards. The game features six token pieces: Eraserhead’s Visor, Grenade Glove, Deku’s Mask, Dummy Bomg, Shigaraki’s Hand, and the UA Sigil. 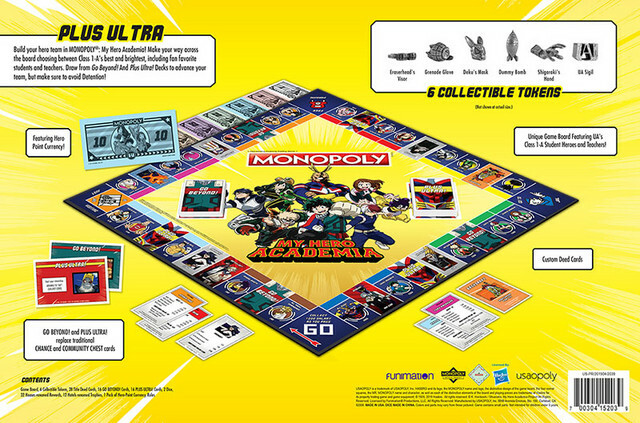 MONOPOLY: My Hero Academia edition will retail for $39.99. A release date for the game has yet to be announced. Monopoly has also been adapted other popular anime including Sailor Moon, Dragon Ball Z, and Pokémon.